Church Ward is situated in the south of Reading, on the town’s south eastern edge. There are 11,500 people living in Church, 19% of whom are children aged 0 to 15 and 11% of whom are aged 65 and over. 76% of the Church population were born in the UK. This is more than the average of Reading. Church is the 2nd most deprived of the 16 Reading Wards. 27% of children in Church are at risk of living in poverty, compared with 18% across Reading. Council-owned housing is maintained by Affinity, an agency accountable to Reading Borough Council. Tenants have sometimes expressed dissatisfaction about the speed and quality of property maintenance, though this has improved. Council estates contrast with more affluent sections of the Ward. Parking is a frequently raised issue, particularly in the north of the Ward, close to the university, where students and University staff often park in residential streets rather than pay to park on campus. Metering has moved the problem outwards to unmetered streets. Unrepaired pot-holes have been a common complaint as Government funding to RBC has been successively cut. A popular, vibrant café in Northumberland Avenue, situated in South Reading Community Centre premises, serves both Church and Whitley Wards, and Councillor surgeries are held there every first Saturday of the month. The Ward holds meetings roughly once a month, with the occasional social gathering, celebration or campaign meeting as the occasions arise. Activists are keen and efficient at delivering Ward newsletters (2-3 a year), 6-monthly Calendars featuring community and other public events planned in the locality covering Church and Whitley Wards, local Banners from the Constituency Party, and election material. Ward activists also take a pride in ensuring a presence is felt by residents all year round, focusing on eliciting local issues and concerns. In this way, we believe we demonstrate good interaction with the community and genuine caring. At election time, canvassing is more traditional and seeking Party support is a natural continuation of our ongoing contact with our residents. 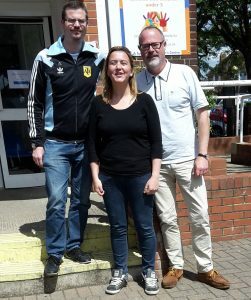 Our most exciting and enduring triumphs include the successful election of three Labour Councillors in Church Ward; and contributing hard work and persistence to help bring about the election to Parliament of Matt Rodda in Reading East on June 8th, 2017. We are proud of having a competent Labour MP and of our efforts during the campaign. We are also proud of our Ward Councillors’ unerring commitment to addressing residents’ concerns and following through casework on their behalf. Please click on the photo of each councillor to view their contact details. Contact any of them to raise issues or seek information concerning the Ward. All three are diligent at seeking and following up casework they identify.